Quartz Countertops, Marble, Soapstone, Granite – Which Is The Best? Quartz countertops are strong and are available here locally in Richmond, Virginia. Are you thinking of replacing your old kitchen countertops or bathroom vanities? 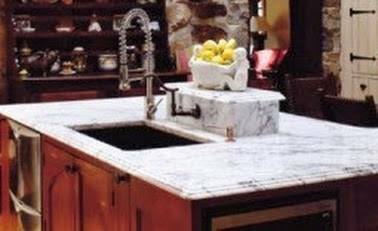 Natural stone countertops have superior properties in comparison with man-made countertops. Let’s go into the details of natural stone, and why it might be the best choice for your home’s kitchen and bathrooms, as well as interior, or exterior eating areas. Any room which needs a hard surface is perfect for natural stone. When it comes to stone, your selection differs in hardness, resilience, look, and type of strength. Quartz is the toughest construction stone on the market. There is a universal measure of hardness called Moh’s Scale of Hardness (1-10) where 10 is the hardness of a diamond. Quartz rates a 7 out of 10 on the Moh’s Scale of Hardness. It is virtually scratch- and scorch-proof and nonporous, so it doesn’t require sealing. Typically, it is not used as a purely natural product. Instead it is often an amalgam of crushed quartz and polyester binding resins. Usually it is at least 70% natural quartz. An example is a product like silestone. It still has a natural look and shine, but one cannot guarantee unique characteristics, especially in regard to color. It is, however, at least as hard as granite, and is more elastic; it has more tensile strength (if that is an issue in your application.) Quartz stone products, like silestone, are a great choice. It is a mostly natural product, with a great look and strength, and is in the same cost range as granite. It is virtually maintenance-free and has the added advantage of more tensile strength. There are various engineered stone selections, silestone being one. Icestone is considered a “green” solution, as it is made mostly of recycled glass with some white Portland cement. It contains no plastic resins. Once poured (often into custom forms), with its glass aggregate and cured, it is buffed to a near shine. It should be sealed because dried lime/gypsum cement can be porous. Since the glass aggregate settles randomly, no one will ever have a piece just like yours. It’s not cheap because it requires experienced labor and expensive cement.